National Hose & Accessory Prior to the storm making land a NHA text group was created to track all employees and their status. Several employees have been displaced and many have realized damage to their homes and vehicles. That said, by utilizing the text group, we were able to confirm that all team members were safe. – NHA reopened for business on Wednesday, August 30th. In addition to reopening to customers in need, NHA is now working with local officials to utilize our location as a donation drop-off for supplies. We are currently in need of diapers, toys and non-perishable food. – Bishop Lifting Products Prior to the storm BLP management implemented a thorough communication plan including a phone number to call for updates as well as constant updates to the company Facebook page. During the storm, a daily internal email was sent to update employees. We have confirmed that our employees are safe, however, many have water damage to their homes and cars and a few have lost everything. – The Houston BLP office reopened for business on Thursday, August 31. We are moving production to other locations and BLP locations are working together and utilizing inventory within our groups to minimize impact to our customers. Our goal is to do everything possible to help our customers meet project deadlines. SBP Holdings has established a dedicated relief fund to support the needs of its employees who have been adversely impacted by Hurricane Harvey and will match all donations made by SBP employees through September 22, 2017. Donations made to this initiative will go directly to SBP Holdings personnel affected by the storm. Your donations will help support these employees and their families through the challenges of recovering and rebuilding. Our team at SBP Holdings appreciates your partnership and support. We will continue to monitor the situation at all our locations and will send out further updates as needed. SAN ANTONIO—For SBP Holdings, parent of rubber goods distributor Singer Equities Inc., it was a big deal when it boosted the size of its corporate staff by 33 percent. That’s right, it went from three employees to four at the start of the year when it appointed Pete Haberbosch to the newly created post of vice president of business development. He will help find potential acquisition targets for Singer and also for Bishop Lifting, SBP Holdings’ other vertical business that focuses on goods and services for rigging and crane applications. Haberbosch joined the CEO, chief financial officer and a controller as the only corporate employees for SBP—and they all work out of different locations. But that’s not surprising because SBP and its verticals have stuck to a decentralized business approach as it has grown significantly, aided by 19 acquisitions made since 1999. For example, the Singer Equities vertical has about 500 employees—roughly the same as Bishop Lifting—and operates from 38 locations that do business under 10 platform companies that have come to Singer through its string of purchases. Its operations boast more than 100 hydraulic crimpers, 642,000 square feet of facility space and hold $39 million worth of inventory, according to the firm’s website. The Singer businesses serve a wide variety of markets, focusing on goods and services related to hydraulic, industrial, composite and metal hose; heavy and light weight conveyor belting; and rubber and metallic gaskets. The organizational changes were prompted by the retirement late last year of Otis Dufrene from day-to-day operations, though he will remain active as chairman and a board member. That meant that Don Fritzinger moved up to Dufrene’s role as president and CEO of SBP Holdings, with Sam Petillo taking over Fritzinger’s prior role as Singer Equities president, and Haberbosch moving to his new position. “We run very decentralized, but we’re in a position where we have this talent we’ve moved in over the years who have been a very quick learn and moved them into areas they can make decisions,” Fritzinger said. One of Singer Equties’ main areas of business is supplying products and services related to conveyor belting. 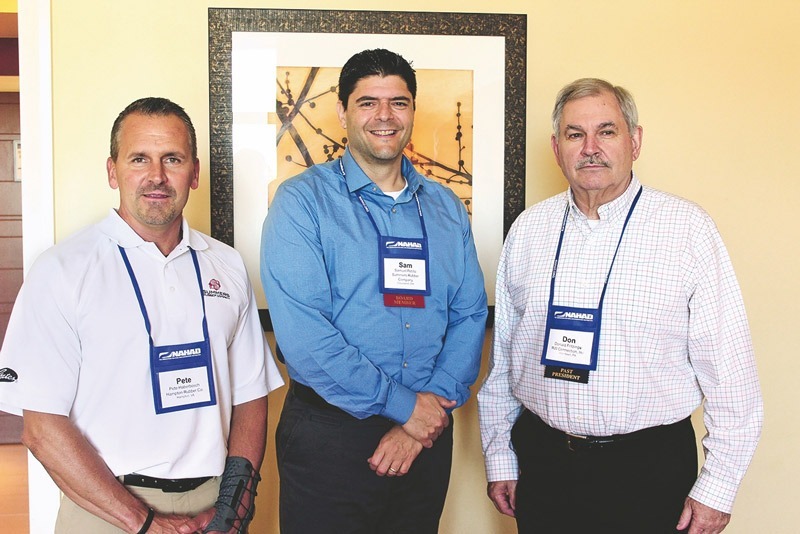 Fritzinger, Petillo and Haberbosch spoke about the company, its reorganization and future plans during the recent NAHAD annual convention in San Antonio. Both Petillo and Haberbosch joined Singer Equities after careers on the manufacturing side of business, as have some other Singer Equities recruits in recent years. Petillo joined in late 2013 after 16 years in manufacturing, first with Saint-Gobain focusing on plastics and silicone, and then 8½ years at Goodyear Engineered Products/Veyance Technologies dealing with industrial and hydraulic hose. Haberbosch was hired about six months later, following 10 years with Gates Corp. and six with Fenner. Both ran a number of platform businesses within the group before taking on their current positions. Petillo said coming from a manufacturing atmosphere he could see things from a larger view. As the Singer Equities portfolio grew, he said Fritzinger needed somebody to come in from an operations standpoint and make things more efficient. For example, two of its more recent acquisitions—Unisource Manufacturing out of Portland, Ore., and Future Hydraulik Inc. headquartered in Laval, Quebec—both have their own private brand products. “That brought on two different private brands, new supply chain channels and a new channel to market,” Petillo said. One of Singer’s newer services is the OnGuard™ program, first developed about 1½ years ago for hose management, and launched earlier this year for conveyor belting. OnGuard™ is about tagging, tracking and testing of hose and conveyor belting, Petillo said. “It’s a cradle-to-grave asset management system,” he said. The service tracks how long a product has been in the field, but also has automatic alerts set up based on discussions with the end user on how long they want the hose or belt to be in use before it gets tested, re-certified or inspected. That is followed up with an inspection or on-site testing. Singer provides products and services to the hydraulic and industrial hose industry. Petillo said on the hose side more than 100 customers are using OnGuard™, with more than 15,000 hoses being tracked. The customers mostly are focused on chemical, oil and gas, and food and beverage applications. For belting, Singer already is tracking products for at least seven customers since the launch. One thing Haberbosch will concentrate on in his new role is to search for a third vertical business to go along with Singer Equities and Bishop Lifting. One possibility, he said, is hydraulic repair. Fritzinger said there are no plans to go away from the decentralized business model. He knows there are arguments to centralize a lot of business aspects, but he said Singer has been able to do some things in terms of purchasing power while still giving the field staff autonomy. In addition, they are using cloud-based, third-party software that gets financial reporting from all the 10 business platforms on the rubber side of the business within four days of the end of the month. Petillo said while some larger firms spend on a headquarters and high-level management teams, SBP puts the funds into inventory to better service customers. In addition, some of the companies they have acquired come with a legacy of buying from certain vendors. And although they have the option to buy from any vendors within the Singer organization, the platform general managers aren’t forced to use specific suppliers. Looking forward, Fritzinger said certain portions of the business have been affected by the downturn in oil and gas, but the firm has diversified its end markets to the point where that sector now accounts for less than 10 percent of business. He also looks for the mergers and acquisitions market to heat back up, both on the supplier/vendor and distribution sides of the business. Some potential acquisition targets delay selling when business tails off, waiting for valuations to recover. You can read the article here too.